I have become obsessed with these adorable color blocked fold over purses that I have seen all over fashion blogs and on Etsy recently. Since my son was born (4 years ago) I have been a slave to a gigantic diaper bag, which consequently transitioned into a large overstuffed purse (of course we’ve gotta have all of those emergency Hot Wheels and antibacterial hand wipes with us at all times!). It’s no wonder my shoulders and back have been killing me! 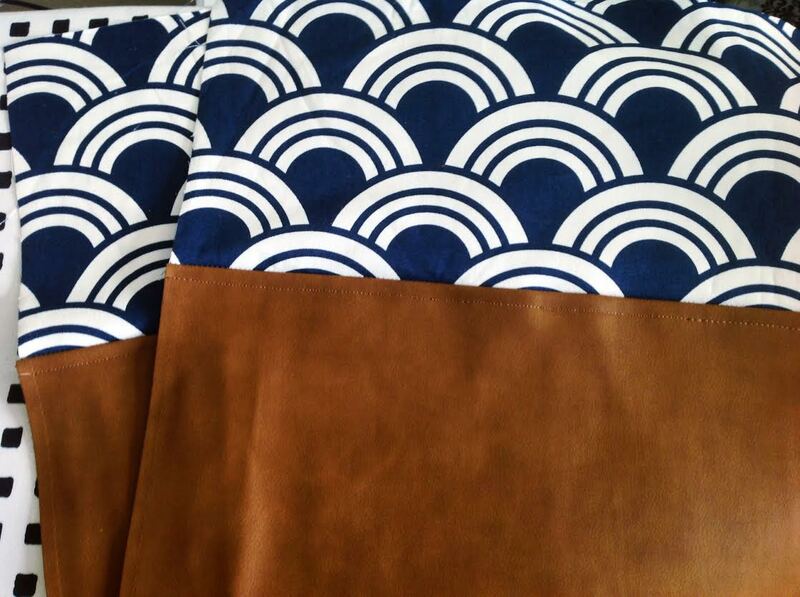 So I think that my initial attraction to the simple “fold over” style bag is just that. It’s simple. It has the option of giving a bit more room if you actually do need it, but it really keeps what you carry around with you to just the essentials. Yet, as much as I loved those beautiful bags on Etsy, I couldn’t find it in my budget to actually purchase one, so I started doing a little research on how to DIY my own. As it turns out, it isn’t as complicated as I initially had thought, and it is much more pocketbook friendly! SO, instead of admiring these adorable bags from afar, I decided to make my own! Here are a couple of the beautiful (p)inspiration finds on Etsy. You can get them here & here. 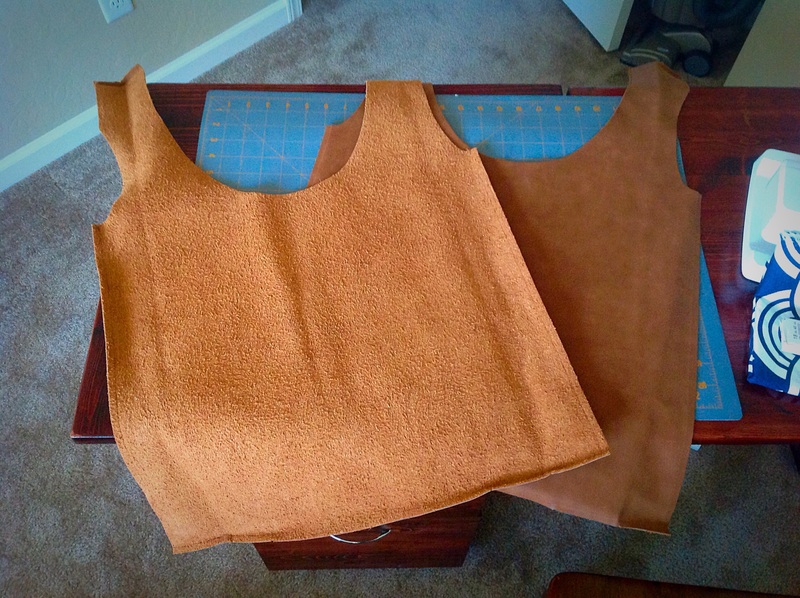 Now that you have your materials, let’s get started sewing! I found this hobo style purse at Target on sale for around $10 a while back in a raw “non leather” material, and I bought it thinking I could use it for something, but I just wasn’t sure what. I definitely knew that the bag needed a liner, but again I wasn’t exactly sure how I would go about doing it. 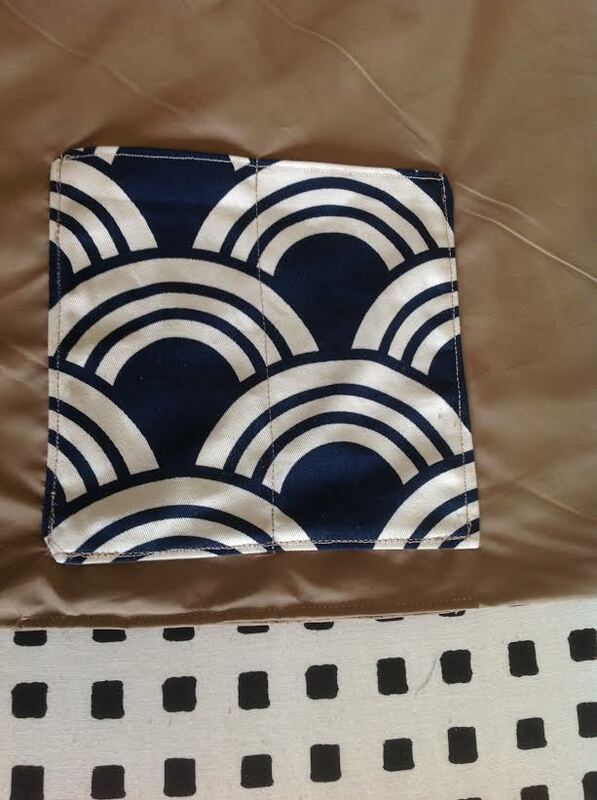 I already had this great bold blue and white “fish scale” patterned material that I had initially wanted to use as the lining, but when I saw my beautiful “(p)inspiration” clutches (see above), which had a similar pattern for the outer contrast fabric, I immediately knew that is how I wanted to use it. I started off with the faux leather bag that I had gotten from Target. If you don’t have a bag like this, you can find some nice leather, vinyl or faux leather at the fabric store of your choice. Really, it’s your preference! I just used what I had on hand, and liked the color of the bag, but it was unlined and had no pockets. Initially, I liked the idea of just having a slouchy leather bag, but after doing some (p)inspiration searching online and on Pinterest, I totally fell in love with the idea of a two tone style fold over clutch. I decided to take the bag apart to see how much usable material I had to work with, so I seam ripped down each side as well as the straps and took the bag completely apart. Luckily there was plenty of material to work with! 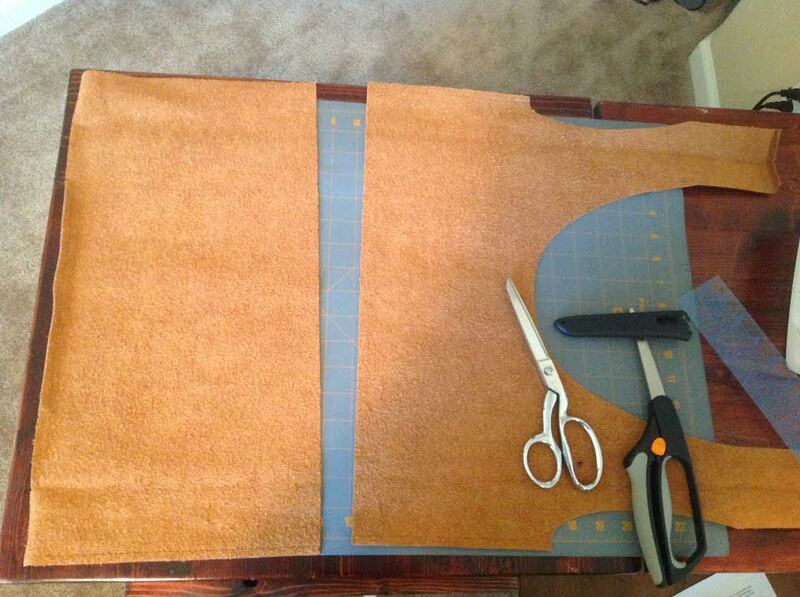 First, cut out your leather material into two 18.5″ x 9.5″ pieces for the bottom of the bag. My “faux leather” bag was already that width, so i just went with it. Really, you can decide how large or small you would like your bag to be and cut accordingly. 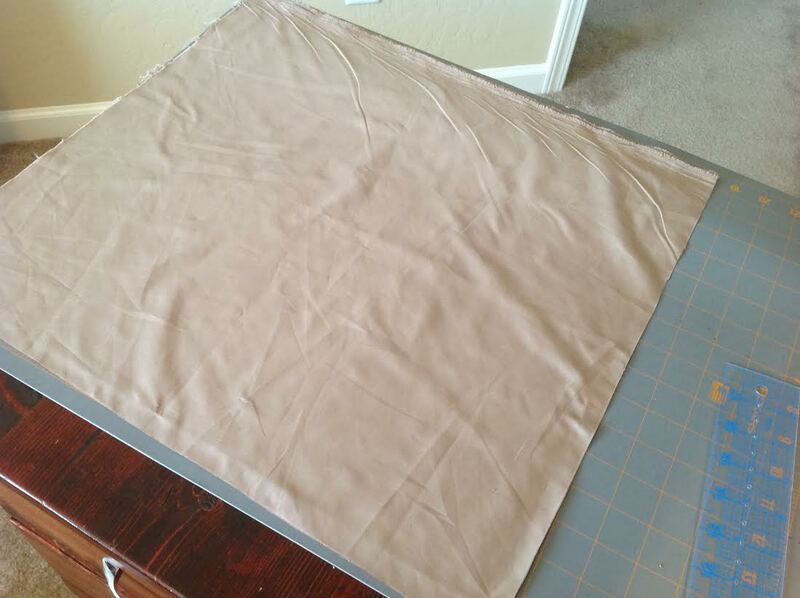 Next, cut your thick cotton material into two 18.5″ x 8.5″ pieces for the top part of the bag. 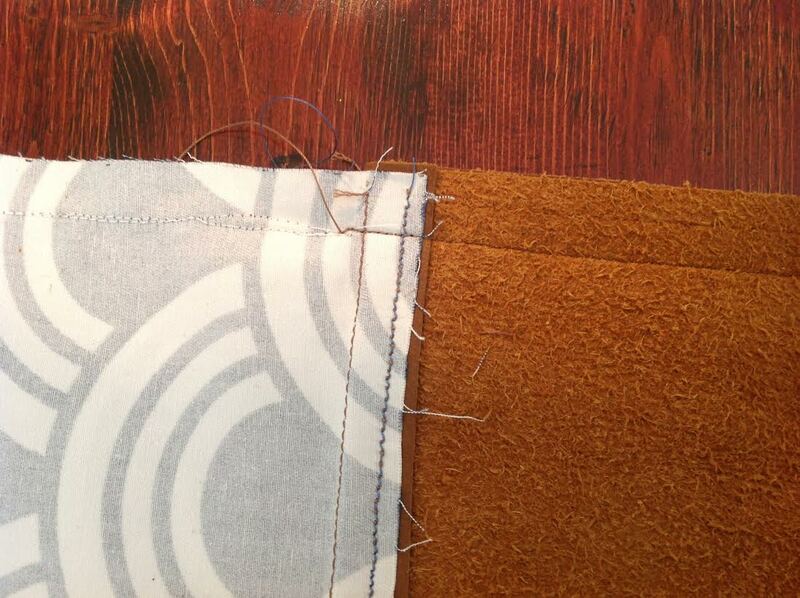 Next, top stitch the seam down approximately 1/4″ on the leather part (give or take). Not only will this make your bag look clean and professional, it also keeps the seam flat. Outer shells complete! The blue and white material looks so much more striking as an exterior statement fabric rather than the lining of the purse, don’t you think? Now you can set those outer pieces aside for a minuet. 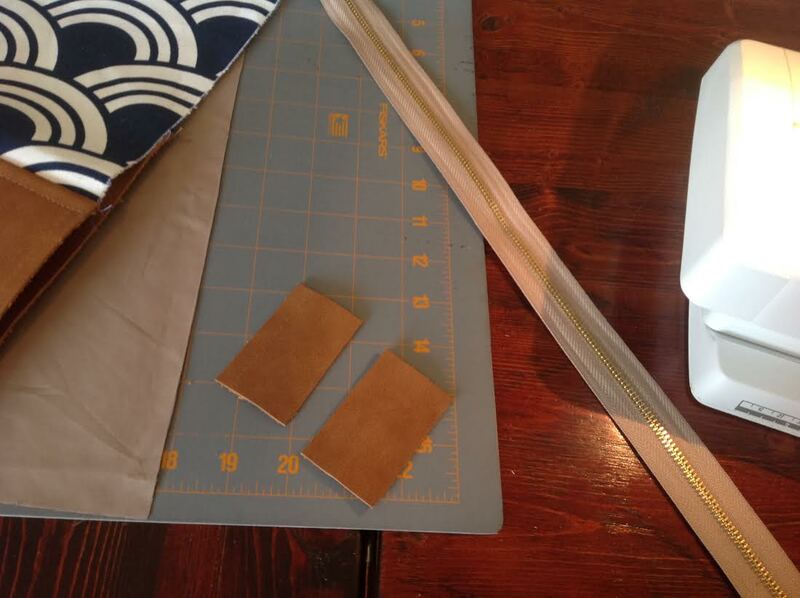 Next, we are going to be making the tabs for the removable purse straps. If you don’t want to add a strap to your bag, skip this section. 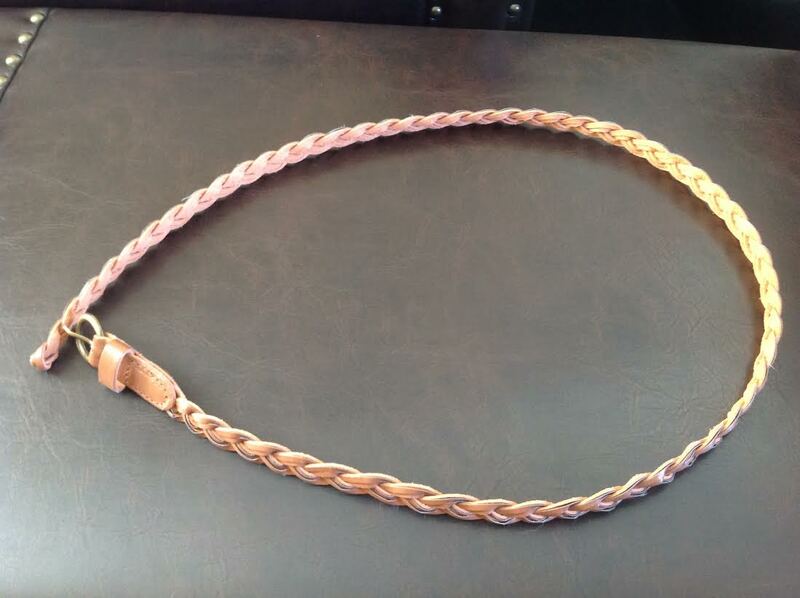 First, you will need two D rings, and two 1.25″x3″ squares of your leather material. Fold the material in half matching short ends together and slide your D ring into the center. Baste together evenly at bottom about 1/4″ from bottom. Repeat for other tab. 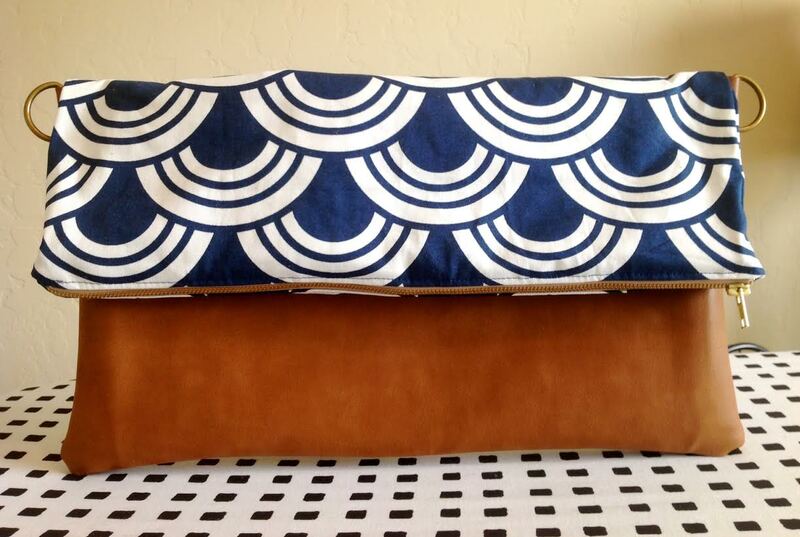 Then, lay tabs just above the leather on the outside of one of your exterior pieces. 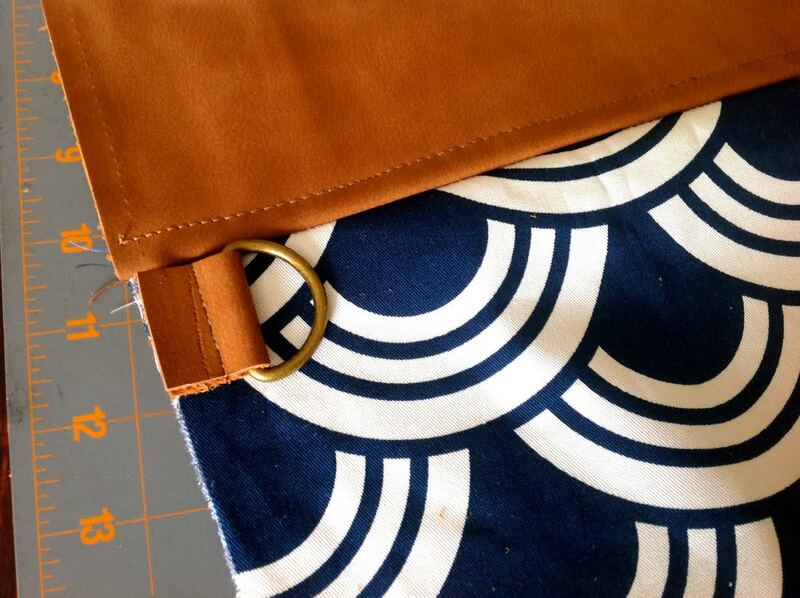 Match up tab edge with edge of your patterned fabric (see image), with D rings facing toward the center of the bag. Stitch onto fabric about 1/2″ from bottom edge of tab. Repeat for other tab. Take a look at your handy work! 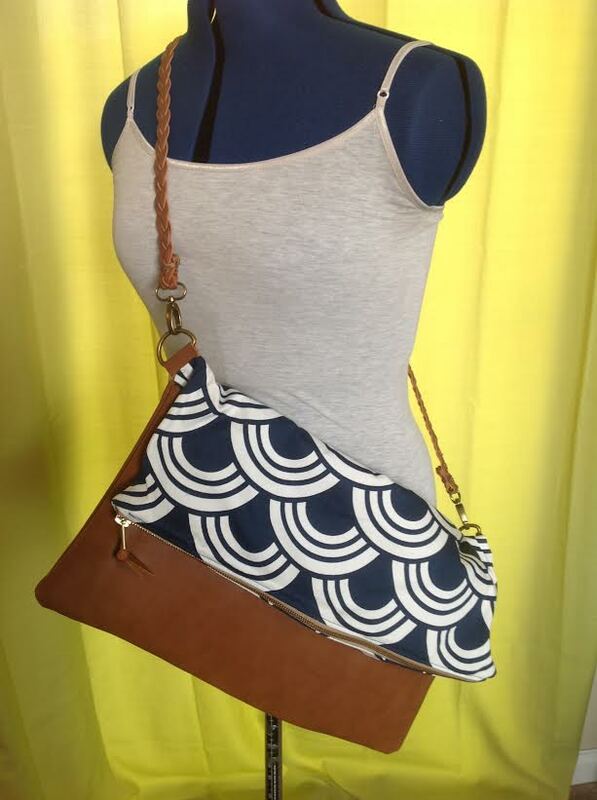 That simple step will now take this bag from just a simple Fold Over Clutch to a Hybrid Fold Over Cross Body Clutch! Congrats! Now we move onto the pocket! For this step, you will need one piece of your lining material cut to be 18.5″x18″. 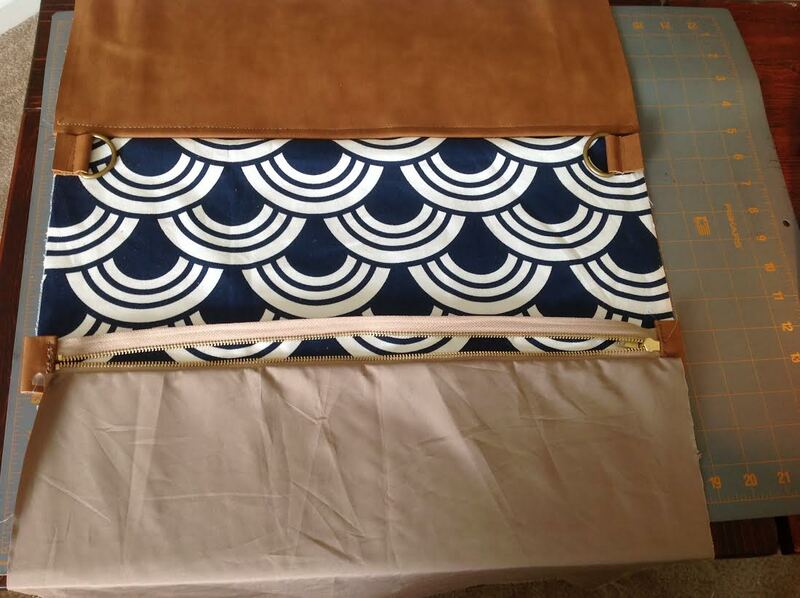 You will also need one 6.5″ piece of your patterned material (for interior pocket), and one 6.5″ piece of lining material (for interior pocket). To make a lined pocket, sew together both the 6.5″ pieces of material (right sides facing) using a 1/4″ seam allowance around edge. Make sure to leave a small opening on one side so you can turn your pocket right side out. Iron flat, and top stitch around all edges, making sure to sew closed your opening. 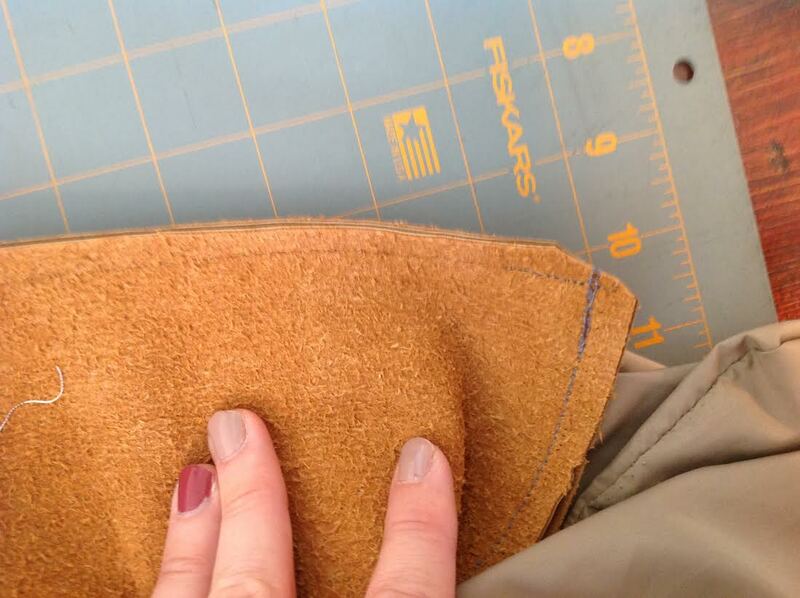 Then, to attach your pocket to the lining material, measure 1.5″-2″ from the bottom, and 6″ from either edge. Pin in place, and sew along both edges as well as along the bottom. 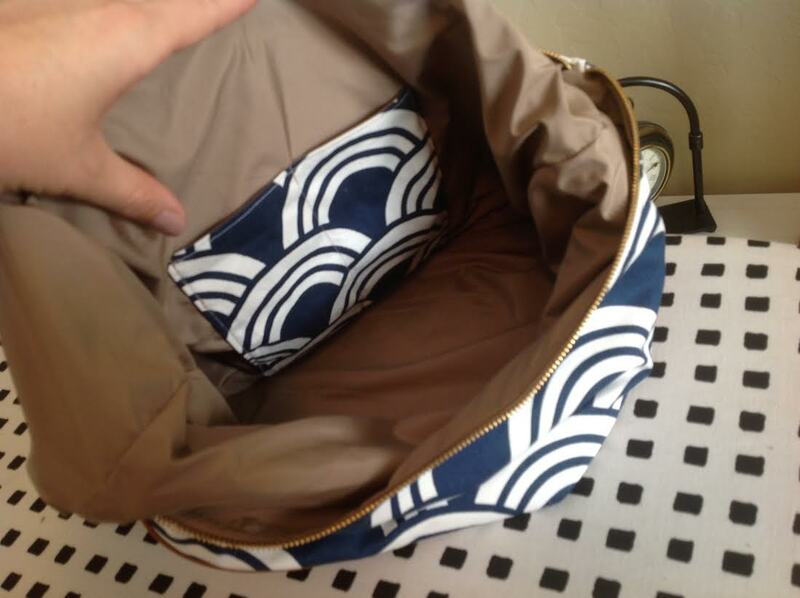 If you want separate compartments, sew down the center of the pocket. (I used my cell phone as my guide) Your pocket can be bigger or smaller depending on your preference. Just make sure to keep it evenly spaced from your edges. Hey look! You made a pocket! Great Job! Now we can attach the zipper! This was the hardest part for me. Initially I added leather tabs on each end of my zipper, but the way I ended up sewing it they accidentally stayed hidden. To make the tabs, I followed the directions from this tutorial. 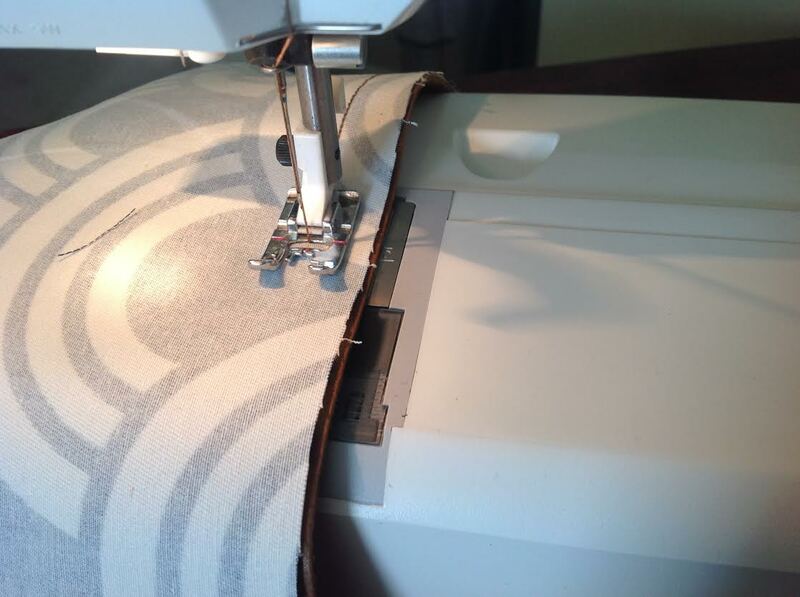 Now that your zipper has tabs on each end, lets attach it to the material! Lay one piece of your outer fabric face up. 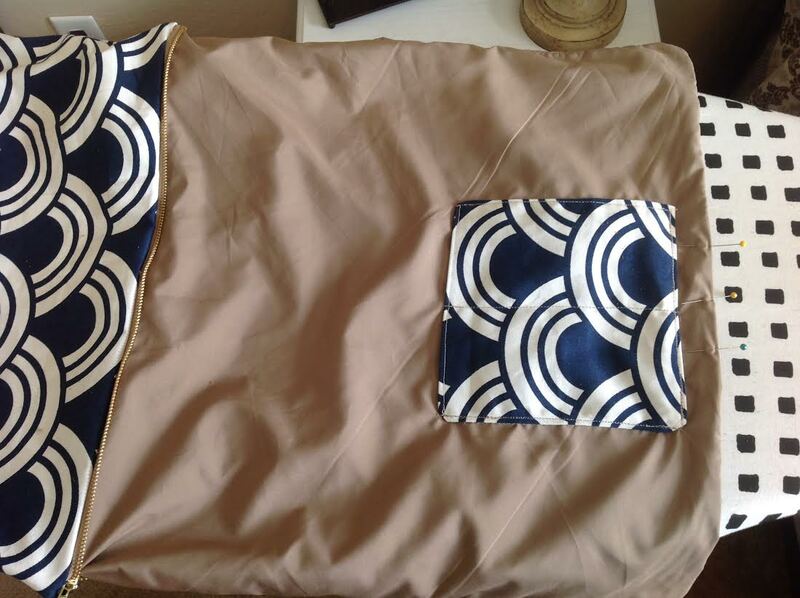 Matching top pieces, lay the zipper facing down on the outer fabric. 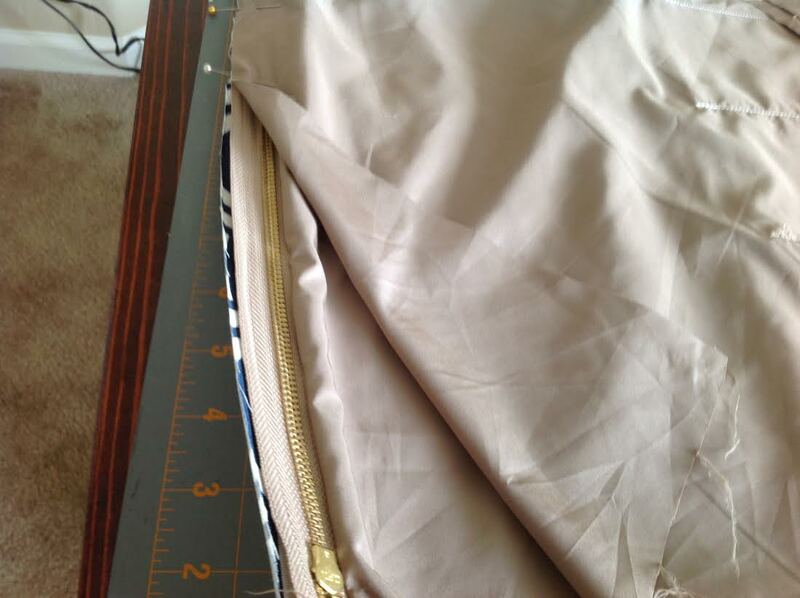 Then lay your lining material face down on top of the zipper and outer material. Make sure that the tops are lined up. (See my picture above for reference. It sounds A LOT more complicated than it really is.) 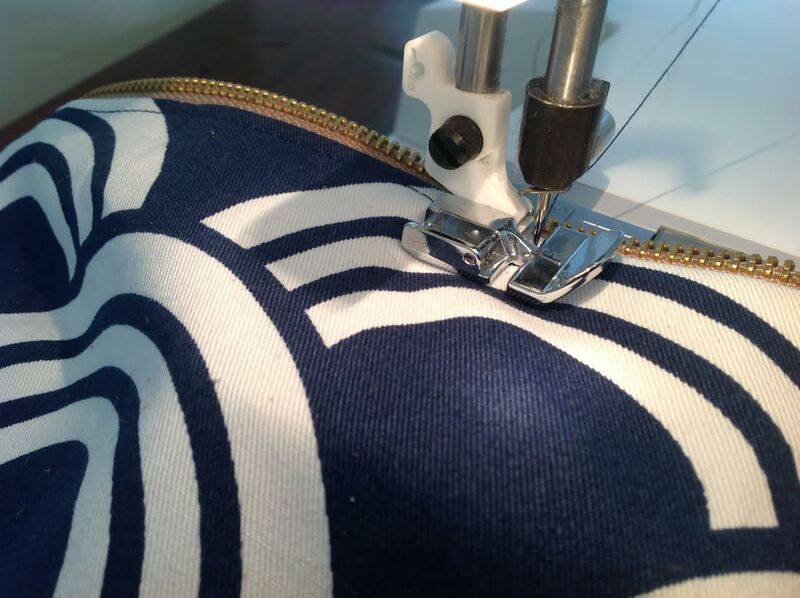 Using a zipper foot on your machine, sew across the top. It SHOULD look something like this (see my image above) when you are finished. I flipped the lining back to show you the zipper. Using image above as reference, fold your lining and outer material away from the zipper so the edge of the zipper without any material is sort of sticking up and out. Place your outer material on the same side as the other outer material (with right sides facing together.) Lay lining material on the side with the other lining, right sides facing together. Pin both to edge of zipper. 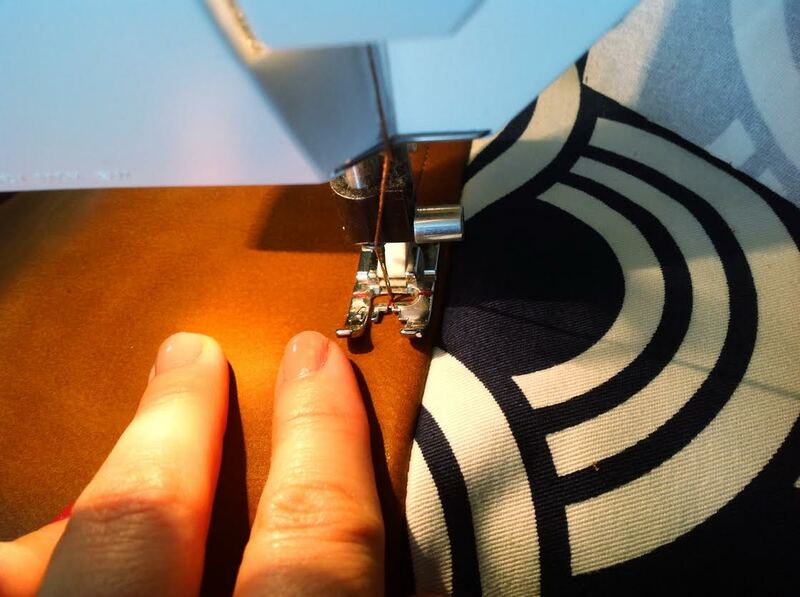 Sew along edge using a zipper foot. 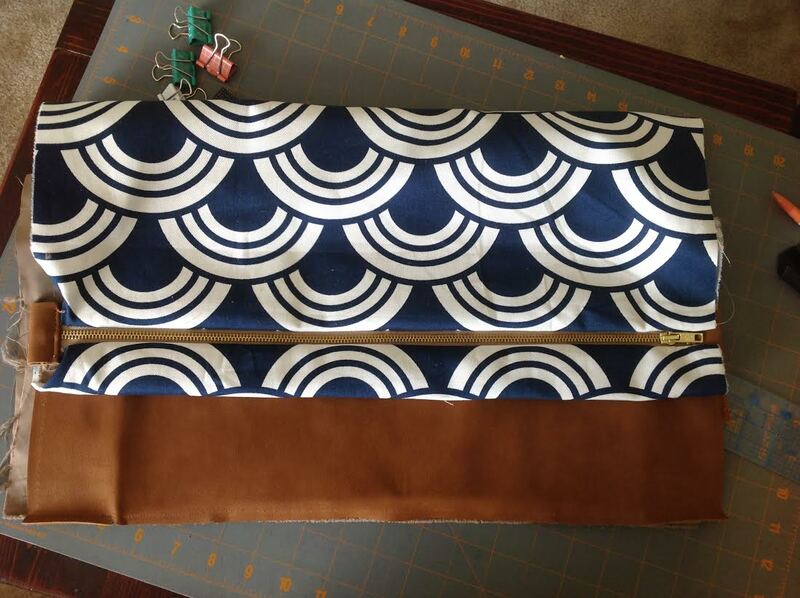 When you are done sewing the zipper in, it should look something like this! Now the hard part is done, lets sew this thing up! Now, turn your bag inside out with the lining pieces facing right side together on one side, and outer material facing right side together. 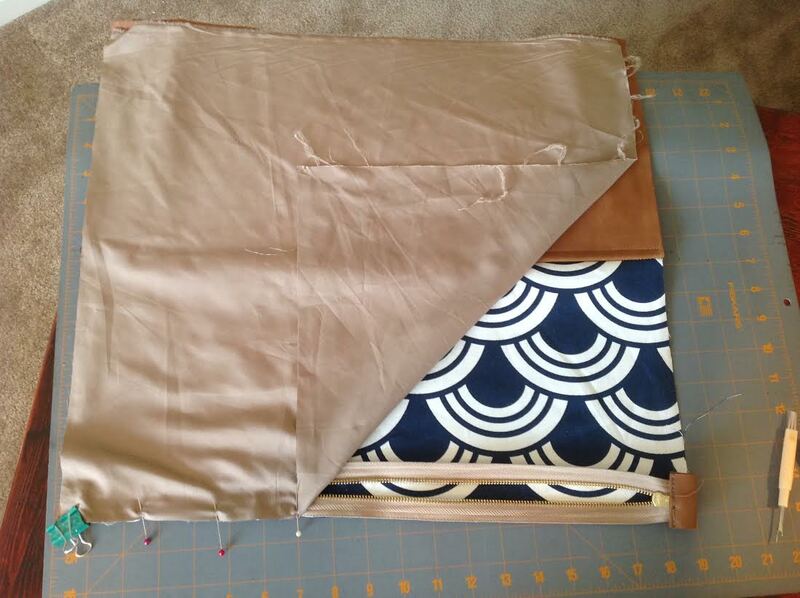 Using about 5/8″ seam allowance, sew around the outer sides and along the bottom of the outer material. 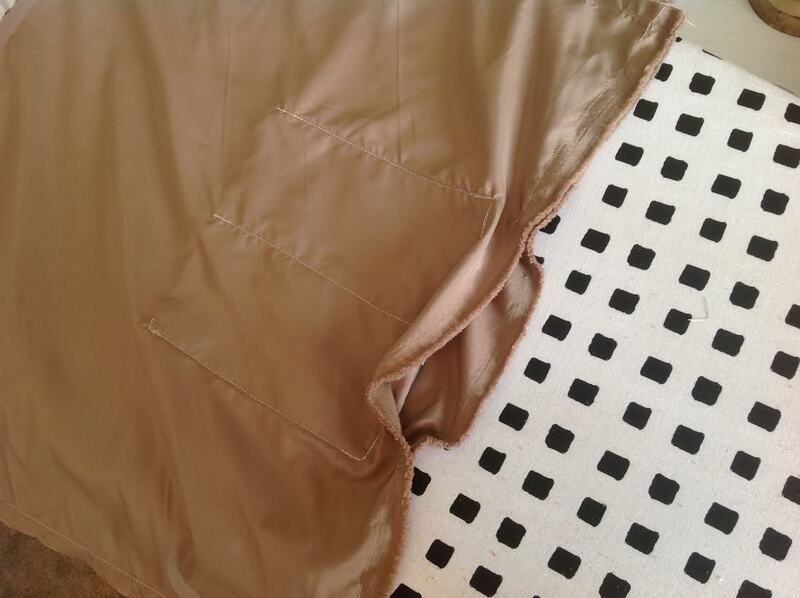 Make sure that you leave an opening on the bottom of your lining! Don’t forget to use your thicker thread when sewing together the leather material, and your all purpose thread for the other materials. Also make sure to reinforce the bottom corners of your bag, and cut the corner off at an angle to reduce bulk. Lets turn this bad boy inside out, and get excited that we are getting close to the end! Reach in through the open hole at the bottom of your lining and pull the outer fabric through the hole. (It should look something like this.) Once that part is done, pin the bottom of your lining where your opening was, and either slip stitch or top stitch close. I decided to top stitch my lining closed. 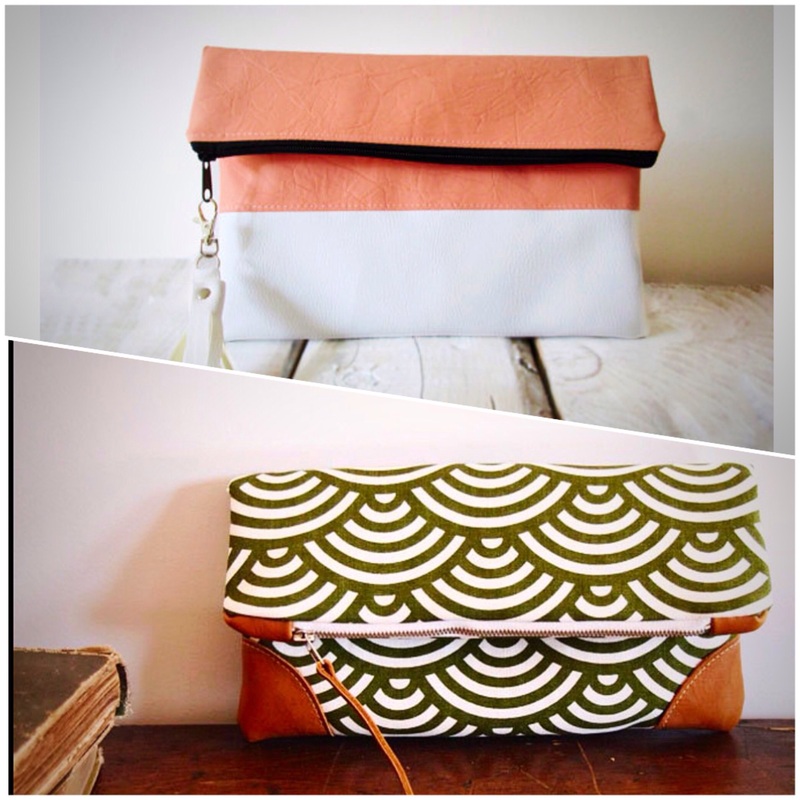 Now you can tuck your lining into the body of your bag! If you want, go ahead and top stitch along the zipper. This will keep your lining from bunching up and getting caught in your zipper. 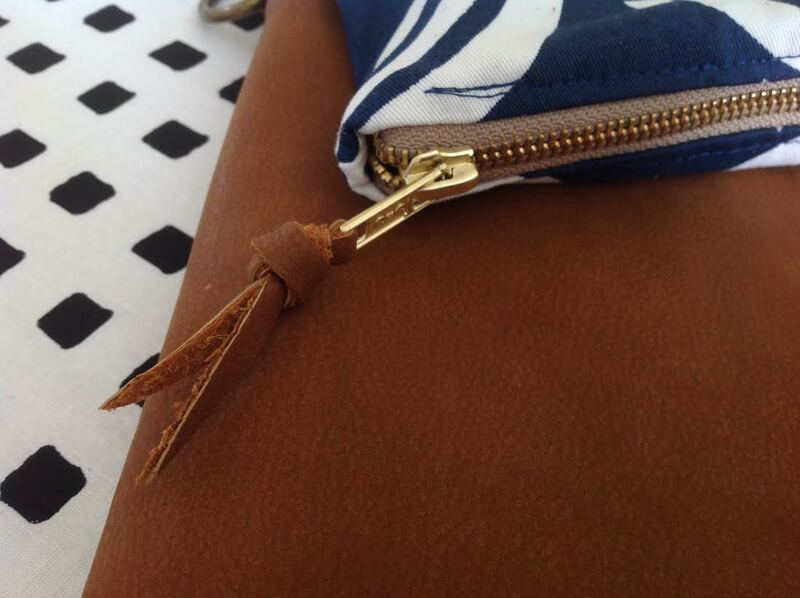 Finally, add a little leather detail to your zipper if you feel so inclined. 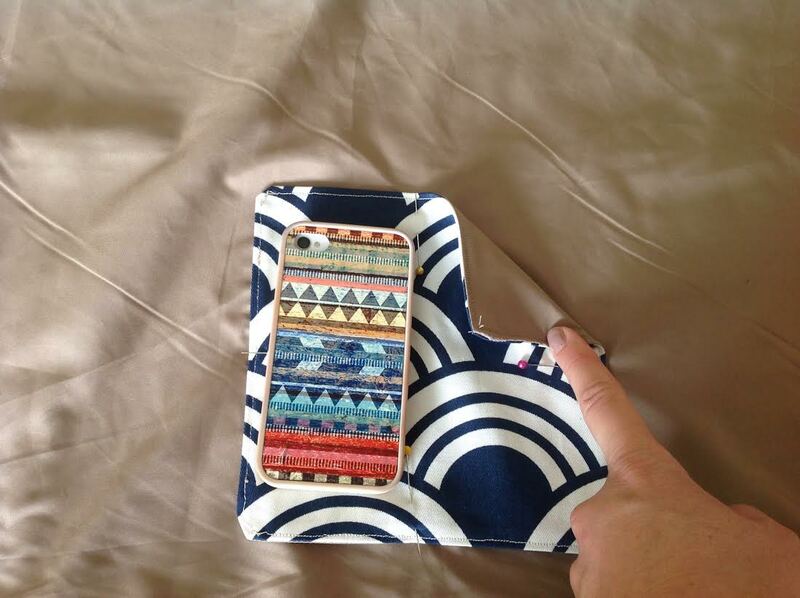 Now zip it up and admire your beautiful new clutch! If you decide not to add a strap for your cross body bag, CONGRATULATIONS! You are finished! Go out and enjoy your new chic, sophisticated Fold Over Clutch! Take a bunch of selfies of you and your new bag, and post them all over to show just how awesome you are! If you want to add strap, great! There are several options that you can try out. You can purchase pre made straps at fabric and craft stores. You can use your leather material, and make a strap. 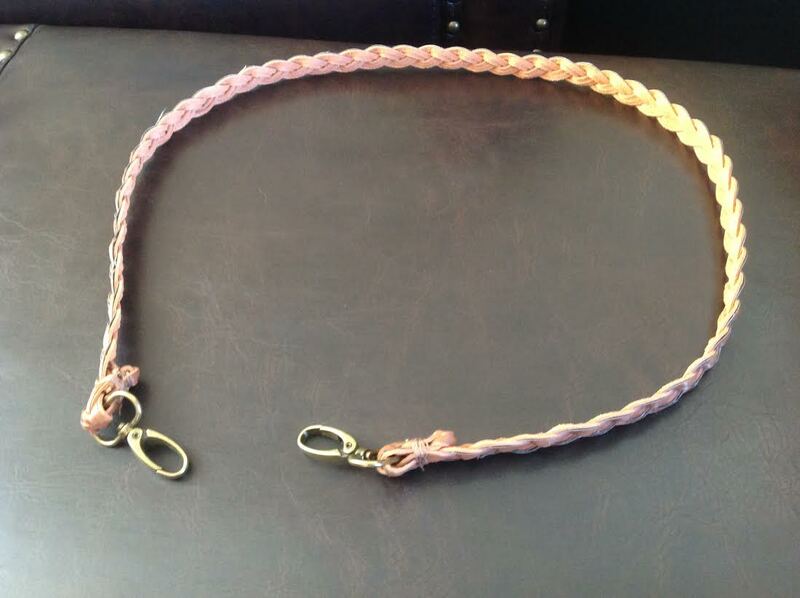 OR you can re-purpose a belt like I did to make a one of a kind removable strap! So, to turn a belt into a purse strap, you must first remove the buckle. Next attach a swivel clip to each end. (I used ones with an antique brass finish to match my D rings). Now, attach the swivel clips to the D rings on each side of your bag and you are ready to hit the town with your new purse!